This product comes in either a fresh-frozen liquid or a powder form. Enhanced energy, vitality and endurance —great for older cats! Optimal nutrition is a key element in the health of your cat and may encourage shiny lustrous coat, healthy skin, strengthened immune system and more. Unfortunately, our cats do not get these important nutrients from the foods we give them. Even the best diets won’t provide your cat the pure high quality nutrition found in E3 Feline. E3 Feline is 100% Certified Organic Aphanizomenon flos-aquae a wild-harvested nutrient dense superfood. By adding E3 Feline to your cat’s daily diet, your cat will receive gram for gram the highest protein and trace mineral concentration of any natural food. E3 Feline is easily absorbed and supports coat, joints, brain function and general health by providing the vitamins, minerals, amino acids and essential fatty acids that your cat needs. No additives, no pesticides and no preservatives. 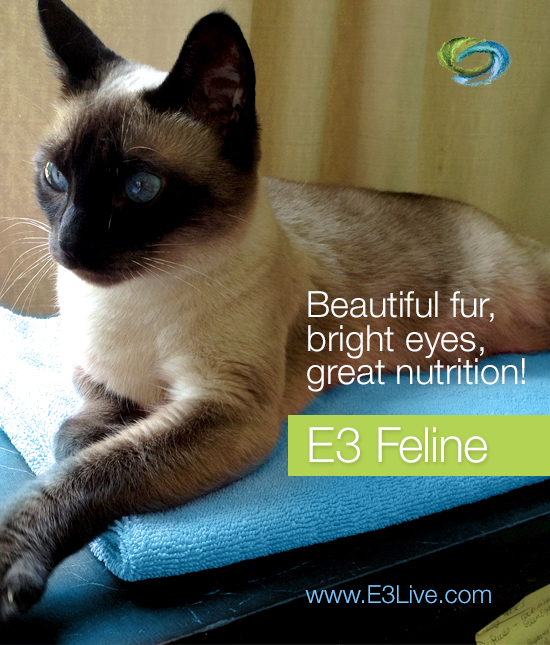 E3 Feline AFA Fresh-Frozen Superfood is a liquid — the most potent and powerful form of AFA. E3Live is the only company to offer AFA in this fresh frozen form. Your pet deserves complete nutrition too! We believe in giving our pets the same nutrient dense superfoods that we consume. If you have questions about this product, please contact us: Sales@E3Live.com or 541-273-2212 or toll-free 888-800-7070.